Remember to stop and smell the yellow flowers. Wind through my hair changes my attitude! The crew and I step out of the Casita around 6 p.m. Oh boy, this is nice! Sprinkles pat my face and a cool wind is blowing. I see dark skies to the south and west. Most of the campers have left. Suddenly I feel a boost to my spirits. Bridget and Spike seem invigorated, too. He takes us across the land between our Loop A over to Loop B, the dry camping area. I hadn’t realized it was so close because we didn’t go down that way due to many campers with dogs that made Spike bark. One can see the expanse down to the lake and over to the mesa (I think that’s what it is!) through breaks in the trees, which, by the way, look like real trees to this Easterner. The crew finds many interesting smells along the way. We walk past the playground and notice there’s a Coke machine at the shower and restroom building. We spot a couple setting up. They have a small, white and black dog. I call over, “Is that a rat terrier?” The lady calls back, “No, it’s supposed to be a chihuahua, according to the breeder, but we don’t think so. She’s too big.” We both agree our dogs are lovable, no matter what they are. Bridget is the leader on the way home! She does a pretty good job. Being worn out from walking gives one focus to find the shortest way home. They both hop into the Casita, lap up some water, and jump up on the bed to find the comfiest spot for their next nap. We are going to stay here through Labor Day weekend. I'm not sure it's the flowers that Spikey is smelling! Oh no. I can hear you groaning all the way from Florida to British Columbia! (That’s my little blog’s range, last time I checked.) I’m sorry to disappoint those of you looking for new adventures in new places. That WILL happen. I want to stop and smell the yellow flowers. I don’t want to be caught in a Labor Day mess. The longer I stay here the more I see. There’s a sign that reads, “Shoreline Trail — 2 miles.” In a day or two, we might walk that trail. People-watch the Labor Day vacationers. Explore the area. Whatever. It takes time to really experience a place. This camp can become a full, lasting memory rather than a quickly fading recollection based on a bad impression brought on by August heat. Here’s some photos from earlier in the day. Of course, I’m including a picture of pink flowers on a cactus . . . the one shown on every blog about travel in the Southwest! Such a welcome surprise of vivid color in this desert landscape. Can someone identify this rugged tree for us? It stands next to the Rocky Point Campground road. Lunch is red beans and rice . . . Tex Mex style! And I’ve got some leftovers for tomorrow. Dinner is chicken breast, potatoes, and salad with mandarin oranges. Not bad for the middle of nowhere! Now that I’m on Mountain time my blog entries are late for those of you on Eastern time. I try to post earlier in the day, but lately it’s taking me a long time to finish a post. I lose connection while trying to transfer photos. This entry was posted in Simple living and tagged cactus, campground, camping, desert, life, nature, New Mexico, Santa Rosa, Travel. Bookmark the permalink. 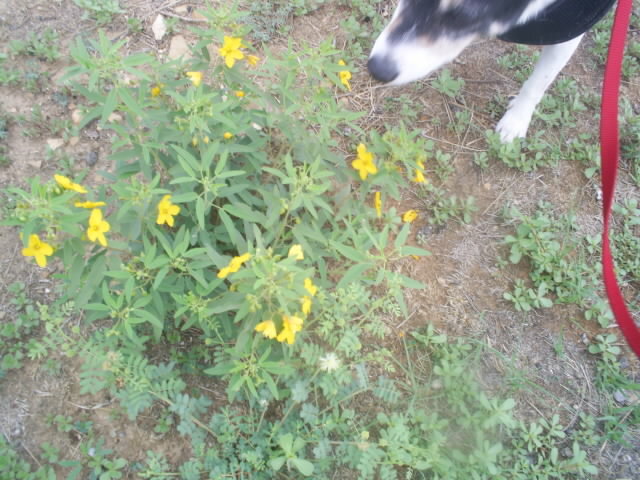 37 Responses to Remember to stop and smell the yellow flowers. Yep, definitely my old nemesis, the juniper. In early spring it sends out clouds of yellow pollen that keeps all of the allergy sufferers unhappy for months. I lived in and around it for 13 years when I lived in Santa Fe. Good to hear you are settling in and that apparently you are feeling much better !!! So glad you’re staying put for a bit! I was worrying you were traveling “too fast”! Good call on your part! Enjoy! It’s some kind of cedar. I’m not sure what dread thing was supposed to happen if you did, but it was pretty bad. Snow joke. Lol. At least by boys. So. Have you thoroughly got “that feeling” yet? You know, when you realize in your gut you are really not camping or on vacation, but embarked on a new life toward a destination unknown? I think you have. You slowing down before you hit the mountains is one sign of it. Scary, ain’t it? Liberating, too. Sounds like a plan. If it suits you, that’s all that matters. Good decision to stick around till after Labor Day. Are you going to stay in the same campsite? You’ll probably have your pick of the non-reserved ones tomorrow if you choose to move. Looks like it’s going to be down in the upper 60s overnight for the next several days so early morning walks should be really nice. FYI, our new granddaughter arrived at 6:47 this evening. Mother and baby are doing well. She’s beautiful be I’m prejudiced. Congratulations to you and Paul and your whole family! I’m glad she’s here and all is well. Smell all the flowers, do not touch the cactus, look at all the rocks, go around all the corners. Sleep late or get up early. Move or don’t move. Check out the sunset or sunrise or both or neither. AHHH the life of the RVer. You are learning fast. Don’t necessarily move until YOU are finished with a location. That can be one day or two weeks or a month. Go Girl! Okay. Yes! I needed that! Looks like you are doing well on the road. Sue, I’m thrilled that you are slowing down and smelling the yellow flowers! I think traveling will be a lot more fun for you when you explore each place, check the trails, and experience, rather than just visit places. just found your blog and sure enjoyed reading your adventures. my 2010 liberty deluxe was hatched one year ago this month. i too am a single female traveler. i also pull my casita with a 2003 red chevy conversion van. i noticed in your blog the heat was getting to your van…i bought a big roll of the reflix silver bubble wrap at lowes and hung it in all the van and casita windows it does a great job of keeping that sun/heat out. my a/c’s do not have to work as hard either. i use command hooks or drapery hooks in the carpet to hang the reflix panels. have fun and stay cool! So nice to hear from you, clinker! Don’t you LOVE your Casita! And having a van expands the space. . . thanks for all the good ideas. I hope you will visit my blog often. New Mexico is beautiful in a way that is different than other places. Most of it doesn’t smack you in the face with a WOW-that’s beautiful. But the beauty grows on you if you’re willing to give it a bit of time. The pink cactus flowers and little yellow flowers somehow bring more pleasure when they’re set against the sand and stones. It’s like you discovered beauty where you didn’t expect it. Enjoy your stay at Santa Rosa Lake. As Paul told a friend today, he doesn’t normally read blogs but yours is interesting and humorous so he enjoys your adventures and the things you find to write about each day. Lovely comment, Reine. And once again I notice how closely you see my point of view on life. Tell Paul I appreciate his word-of-mouth advertising! Great decision to stay put for the holiday pick the best spot for you now and hang out there till the madness is over. I’m glad your getting to smell the flowers, I often have to remind myself to do the same as I have a tendency to drive more than I should, although I am much better now than when I first started RV’n. It is fun having those fur kids with you isn’t it ? Their antics will entertain you and their companionship is a pleasure too. I am so glad your feeling better, a few more days of rest and you’ll be in top form. I haven’t cooked much for several years. It’s fun getting back into it, especially with a new kitchen and new pots and pans. I don’t think I could do this without the crew. I really don’t. When I wake up in the morning, they’re so happy and bright, ready to go out and greet the day. They remind me to slow down some times and to speed up other times. Making them happy makes me happy. I read your recent post. I hope your pup’s vet vistit went well. Thanks for the reminder, JoJo. I mean to do that today. I never expected this response. I remember how excited I was when the blog got it’s first 100 hits. The day of orientation and first camp it got over 1,200 hits! I know to longtime, really good bloggers, that’s tiny. To me, it’s incredible. Someone on the Casita Travel Trailer forum posted a Casita Sighting on US285 near Artesia NM on Friday. Said it was a white van pulling a new Casita. I replied that it was most likely you and the crew. If you are not already a member of this forum, please check it out. There is so much helpful info for Casita owners. http://www.casitaforum.com It will also give you a chance to get to know other casita owners in the areas of your travels. I was wondering why you didn’t go to the mountains until summer is over and then spent the winter exploring Texas and NM. I am counting down the months until I can join you in the ranks of full timers. Until then I will live through your adventuress. That probably was me going through Artesia. Yes, I’m familiar with the casita forum. I’ve read many of the threads there. I have intermittent connection here. It takes a long time to put up my blog and respond to comments because I lose signal. That’s why I haven’t been visiting other sites like the casita forum very much lately. If you look back over my blog entries, you’ll see that I retired from my job in Georgia in May. I then had to wait for my house to sell. Once my house sold in mid-Aug. I was free to go to Rice, TX and pick up my Casita. That put me in the right place at the wrong time. I didn’t want to go south for hurricane season, so I tried to get to the NM mountains. I stalled out here in Santa Rosa, NM, where I’m relaxing for a while. Congrats Sue! Stopping to smell the flowers should do wonders. You’re right, Barrie. I think it might suit me best to stay longer in camps. Being on the road too much gives me a feeling of being on a rushed vacation. Staying put for awhile makes me feel at home where I’m parked. Just a quick note to tell you how much I’ve been enjoying your blog. It especially resonates with me because I’m planning to follow in your… tire tracks. I haven’t yet ordered my Casita — I’ll likely order a 17 SD in November or December — but your blog provides me with a vicarious preview in the meantime. I particularly enjoyed your accounts of picking up your Liberty in Rice and the subsequent days’ camping. My crew will consist of a co-pilot named Lexi, a mischievous 2-year-old black and white Jack Russell who’s about the same size as your trusty crewmates. I’ve been schooling Lexi in the finer points of GPS operation, but her short attention span is an impediment to her progress. She does listen intently, head cocked, when it speaks, however, so that’s to her credit. You’ve got a great life ahead of you! If you order your Spirit Deluxe in November, it will probably be ready in March. The SD is a good floorplan for a solo traveler with a dog. It is so much fun having a canine companion in this vagabond life. Your Lexi, being a terrier, will keep you going all the time! Rat terriers (actually mine are mixed breeds) are not quite as energetic as a Jack Russell, but then I have two, twice the energy! Not that there isn’t upkeep to a Casita. It’s different somehow. Thanks for the compliment. I hope you continue to enjoy the blog. Still enjoying your adventures. Color me green with envy. Enjoy your freedom! Thanks, Ginny, for letting me know you’re still with me. I’ll probably run into some situations that will curb your envy, for sure! For now, it’s all good. Hope it lasts! Wow, you are scaling down quite a bit! I’m glad you fell in love with the Casita. Thank you for sharing your thoughts. And thanks also for reminding me I’m not in the entertainment business! Patti, the fact that you love the Casita says a lot about you. I wish you many happy days and nights in the one that becomes YOURS! I’m caught up once again on your blogs. We had a lot of high winds and rain from the hurricane, but the sky is blue once again and the temp is in the 80’s here in North Carolina. I see you are beginning to enjoy staying a few days to check things out. The time we spend is all we have except out memories, so live in the moment and enjoy the little things, like yellow flowers and cacti in bloom. Glad Irene is gone and you are still here! I hope you didn’t suffer any damage or heartache. I sat in the middle of a drought, everything crispy and brown, and here you were being drenched and blown about! Yet we talk as if you’re in a chair across the room . . . Listen to me talk …. geez, I admit . . . I’m still amazed at the invention of the telegraph.